Be tough yet gentle, humble yet bold, swayed always by beauty and truth. I think of Bob Pieh. These are Bob’s words. 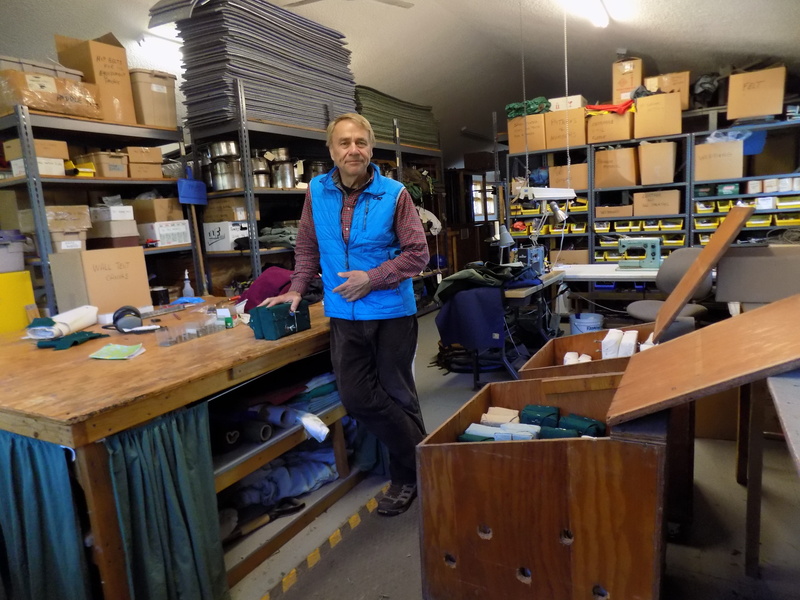 He was the first Director of this school, back when it was called the “Minnesota Outward Bound School.” Bob was instrumental in connecting people to the power of experiential learning and he loved the Boundary Waters. Bob has passed away, but I did meet him 50 years ago, here at Homeplace, on this day. I pass the Dog Yard and almost keep walking down to Birch Lake and the Kawishiwi, but I can’t resist stopping in at “Trips.” The Trips building now houses all of the gear it takes to get VOBS’ students out into the field. In the height of summer, VOBS can put up to 30 crews of students out in the Boundary Waters– that means a lot of gear. Trips wa Bob’s idea. I peek in and take a look around. This orderly logistics hub sits high above Birch Lake, on the site where “The Humpy” used to sit. The Humpy was a big silver quonset hut– not very glamorous– and it was the old mess hall. The rock out in front of Trips is called Humpy Rock, a tribute to this past. From here I can see the waterfront where we practiced “drownproofing” with a monster swim test. I swam my first mile out there– four laps across Birch Lake. Today students go through immersion training, learning to tip their canoes and cope with a capsize. I stand up on Humpy for a long time, remembering. Dan Blessing, the Summer Program Director, finds me and I explain that my month-long Minnesota Outward Bound Course began here on this day 50 years ago. This is a pilgrimage of sorts. Every August 10, for the last 50 years, I’ve marked the occasion by living up to the pledge I took at my Outward Bound graduation. Fifty years ago, I promised to challenge myself, and, every year, I do. Yesterday, I completed a week-long Boundary Waters canoe trip with my son, daughter, and three of my grandchildren in honor of my 50th Outward Bound anniversary. I tell Dan that Outward Bound transformed my life. It turned a lonely, insecure kid with little self-confidence into an adventurer, both outwardly and inwardly. Outward Bound taught me to feel at home in the wilds and it set me on a path of personal growth that I follow to this day. At Outward Bound, I find the best of myself. Fifty years ago, I found my strengths as a youth. Today, I’ve returned to find them as a senior. I’m here for the adventure of Alumni Service week. It shouldn’t surprise me that Outward Bound still has a transformative effect in my life. Back here at Homeplace, I find a heart-centered, thriving community that does remarkable work with persons of all ages, places, and life circumstances. I find once again that I am welcomed into the Outward bound fold. I spend my time among new alumni friends, instructors and staff, as we repair canoes, fix up buildings, assemble bunk beds, chop wood and share memories and life journeys. Here, working side by side among these people, in this community, it’s easy for me to understand why OUTSIDE magazine names VOBS among the best places to work in the U.S. So now I’m making plans to return to Ely every summer and volunteer at Homeplace. I want to open my heart by helping give others the great adventure I had at age 17. I want to pay the last five decades forward. My Outward Bound experience keeps me growing, gaining new insights, finding new pathways, making new friends, reaching out in new ways and achieving new goals. Dan is amazed that, after half a century, I keep coming back. For me, it is simply coming home. In a sense, I’ve never left. Outward Bound initiated me in the way of the wilderness and self-discovery. 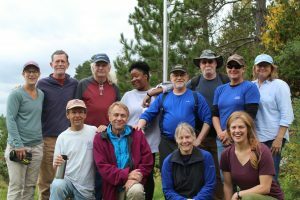 If you’re an alumni of Voyageur Outward Bound School and would be interested in contributing a guest post to our blog, please contact our Alumni Manager at Holly.Noble@vobs.org or (651) 407-0640. Holly Noble is the Marketing and Communications Manager at Voyageur Outward Bound School and is also our alumni outreach contact. With over 10 years of experience in non-profit business development, admissions and communications, Holly's extensive background is pushing VOBS to a whole new level. She has an enthusiasm that never fades and brings new meaning to the phrase "let's just get it done." In her time away from VOBS, Holly is a committed high school girls hockey coach, a lover of the outdoors and animals, and can be found daydreaming/planning her next big travel adventure.